LIMITED STOCK. GET YOURS NOW! One of the most iconic characters from the Star Wars series is now a Premium Hikari Sofubi Vinyl Figure! Featuring a classic black color scheme, fans will adore the ice-blue highlighting that makes this Darth Vader incarnation stands apart! 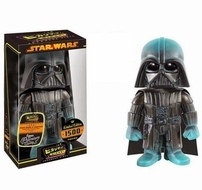 The Star Wars Darth Vader Lightning Premium Hikari Sofubi Vinyl Figure measures approximately 8-inches tall and is limited to only 1,500 individually numbered pieces world wide.